We have a passion for trees- and that passion is rooted in our families long agricultural history. 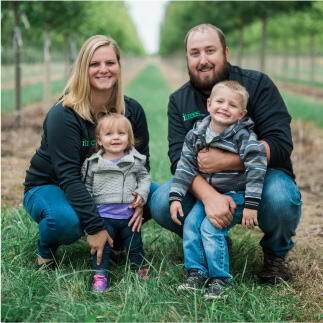 Not only do we have decades of experience in the nursery and landscape industries, but Chris and Marlee Harford are the fifth generation to own and operate the Harford Family Farm in Northern Illinois, raising corn, soybeans, and grapes. 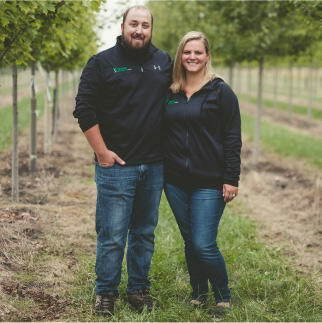 In addition to growing up living and working on the family farm, Chris worked with his sister and brother-in-law, Becky and Jamie Thomas, who have also continued the family's agricultural tradition and legacy by starting one of the most well-respected local nurseries in the Chicagoland area, Spring Grove Nursery. It was out of this love of agriculture, trees, and entrepreneurship that iTrees.com was born! It has become our passion to provide a simple way for our customers to access high quality, locally grown, and beautiful specimen trees- and offer them the best service possible, from expert advice on tree selection to flawless, careful installation, complete with our full replacement warranty. We are a small family business- and above all we truly care about the customers we serve, and want to provide the best possible experience for all involved. 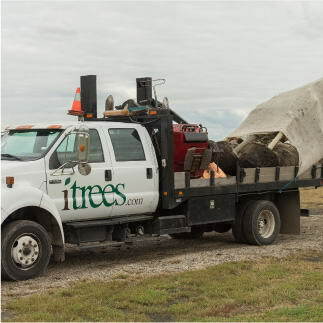 For us, iTrees.com is a labor of love- and the best part of the job is introducing our customers to the wonderful world of trees, and getting people back to their roots by connecting people with the agricultural community! We realize buying trees online may not be the norm, but we assure you that we are a local business- and we only select trees from the highest quality, local nurseries. In addition to providing the best quality trees at the best possible prices, we are careful to focus our attention on customer service. We want you to spread the word, and we try and provide the absolute best service possible. 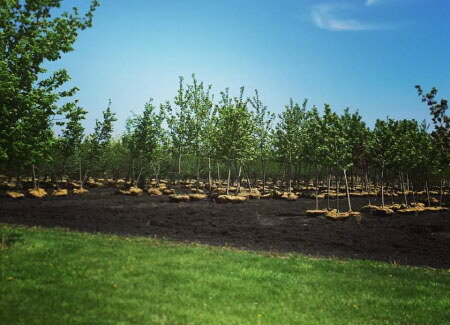 We train our crews to treat our customers’ property as if it was their own, and not only make sure their trees are planted correctly but also we strive to make sure that we leave your property looking better than it did before we arrived! We back up our trees with a full replacement warranty, and we stand behind our trees. Our crew is helpful, friendly, knowledgeable, and they are just great people. 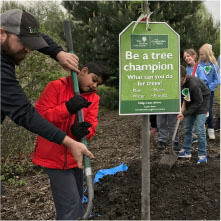 We also stand behind our communities and are heavily involved with all sorts of local charities- from donating and planting trees with local schools and organizations to donating trees to our tornado-ravaged local communities. We just love trees- and our mission is to provide our customers with a product and experience that makes them love trees as much as we do- we hope that all our customers, and our communities, will Join the TREEvolution along with us! 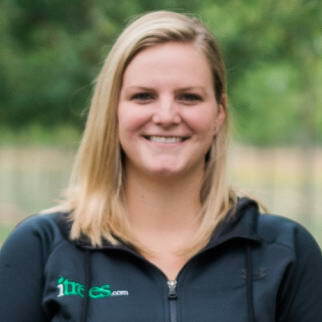 Marlee started working at iTrees.com in 2013 when she decided to jump into the growing family business, and since that time she has really ran with it. Marlee is a true people person, and her passion for design has helped her catch on fast. In only four short years, Marlee has effectively taken over, running all the day to day operations at iTrees.com including sales, scheduling, customer service, administration, and marketing! Marlee truly cares about her customers and is very knowledgeable on all types of trees. She can help with tree layout, design, and selection- and has truly become an expert! Her favorite part of the job is meeting with customers, and helping them beautify their yard. She loves trees- and is always excited when she is able to spread that love of trees to her customers! Marlee loves working at iTrees.com and helping to make the earth gorgeous, but even more, she loves owning and working in a family business. In her spare time, Marlee enjoys time with her husband and three children, and loves spending time outdoors! 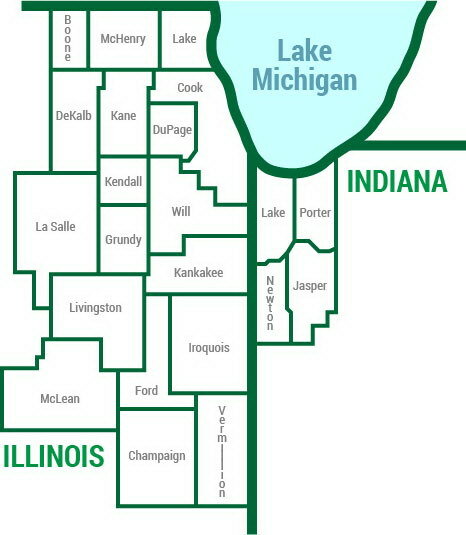 Chris started iTrees.com in 2007, after graduating from the University of Illinois. Having grown up on the farm and with a strong entrepreneurial spirit, Chris decided to move back to his hometown, start his own business, and eventually take over the family farm. With his love of technology, trees, and agriculture- iTrees.com was born, and it took off from day one. The company was born from a simple idea- make it as convenient and simple as possible for homeowners to find an affordable, and diverse selection of trees! In 2012 Chris took over the family farm as well, becoming the fifth generation to own and operate Harford Farms, raising corn and soybeans. Marlee stepped up to the plate, and now Chris and Marlee work side by side running both businesses. In his spare time, Chris enjoys spending time with his wife and three children, working on the farm, spending time outdoors, and writing! 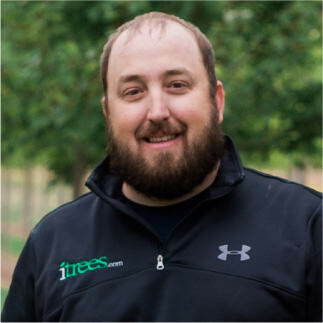 Kyle started with iTrees.com in 2013, and has since become the crew manager, and is in charge of all tree installations for customers. Kyle comes from a farm family and has a strong background in agriculture and hard work. Kyle is extremely personable, and loves talking with customers- he always goes out of his way to make sure customers get exactly what they want, and makes sure that he leaves their property looking better than it was when he arrived! Kyle has a strong work ethic, as well as a strong desire to make his customers happy. We are constantly receiving praise from our customers on his positive attitude and friendliness. 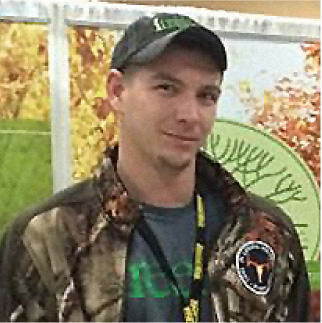 Kyle is very knowledgeable about trees and enjoys the satisfaction of seeing the job before, and after, and seeing the impact that trees make on the landscape. In his spare time, Kyle enjoys spending time with his fiancee and daughter, working on his family farm, and working on trucks in his shop! 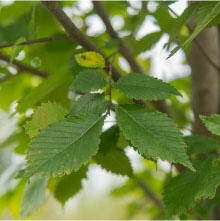 Here's the deal - we think trees are awesome and we want to see as many of them as possible all across our communities. At iTrees.com we don't just feel like we have an obligation to our communities, we sincerely enjoy being involved with charities and organizations working to improve our communities- it makes us happy! 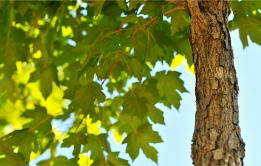 In 2012, we introduced our CommuniTrees Partner Program, which works directly with municipalities, homeowners' associations, schools, clubs, and any other organizations interested in adding trees to their community, and which provides discounts for local residents, as well as free trees for their communities. In addition we have been very involved in donating trees directly to local organizations, donating to fundraisers, and donating trees to help replace the lost canopies in our local communities which have been devastated by tornadoes in recent years. In 2017 we are implementing some exciting new programs to bring excellent causes to the forefront of our business. We are partnering with the Arbor Day Foundation and allowing our customers to Join the TreeVolution! 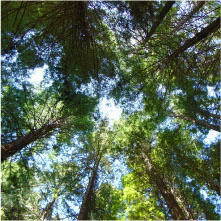 For every tree we sell, we will donate one tree to be planted in the national forests through the Arbor Day Foundation. Keep an eye out because we will also be featuring other causes throughout the year!